Hello and welcome to another article here on DronesWorld.net. Today we focus on our younger audience, they too deserve to experience the wonders of flying a drone. This is our best drones for kids extensive guide for kids and parents. We at DronesWorld believe our readers should always be informed, especially parents when looking for a toy drone for kids. Worry not, drones are not dangerous and they are easier to control then you expect. If you read our guide, by the end of it you will know how to act accordingly and choose what are the best drones for kids. We are going to start this list off pretty slow… with the world’s smallest quadcopter ever created. Cheerson CX10 is the name and believe me – this thing is tiny. It’s so tiny that you can easily place 2 of them into your hand and still clench it. There are several versions of this drone… some even come with FPV-capable cameras.However, for keeping things nice and simple, we went ahead with the most basic version – CX10. Cheerrson CX10 is a harmless drone perfect for your little ones. It has enough power and maneuverability to satisfy their adrenaline cravings. It’s a great way of keeping your kids away from TV’s and smartphones and sending them outside to play with their new toy. And these things aren’t expensive at all… They might not be all that advanced, but they’re cheaper than average movie tickets. That’s essentially what makes them such a splendid product – they are so cheap and easy to replace that you don’t even have to worry about your kids ruining it during the first few days of using it. As for the actual drone, it’s running on tiny brushed motors which have roughly 3-4 hours of life if not overly forced. While that might seem short at first, it must be added that its flight time per charge goes only around 5 minutes. Yes, this means CX10’s motors can endure around 50 charges. Cheerson CX10 is a fun little drone for kids, there’s absolutely no doubt about that. Plus, it sports LEDs, low voltage alarm, and 3 adjustable flight speeds. Heck, even 1-key flipping is available with this one, guaranteeing to entertain your children for weeks to come. There’s also a miniature controller that comes with the package. It doesn’t look like much but does its job appropriately. Lastly, you won’t have to sweat about going out of range with Cheerson CX10. It can handle anywhere between 20 and 50 meters, depending on optical visibility. The 4th drone for kids place belongs to Syma X11C, one of Syma’s newer (although newer is a rather relative term here) models bearing upgraded hardware and gorgeous design scheme. The price tag reveals that we are really talking about a kid friendly drone here. It’s lightweight, doesn’t require FAA license and will provide a ton of fun to children of all ages. Best of all, it even sports propeller guards that will protect your children and propellers. Let’s start off with the fact that this little fella is a beautiful drone, definitely one of the better looking drones for children in my opinion. It’s not too huge and sports a well-rounded body that’s going to be appealing to both kids and grown-ups. In terms of flight performance, Syma X11C flies pretty well with little to no drift. Strong winds are an issue though, but that’s to be expected since we are talking about a miniature brushed model. To further up their drone’s worth, Syma also added a nice little HD camera. It’s not the world’s greatest camera by any means, but it’s still good for taking occasional aerial selfies or videos. After taking the first glance at the controller that comes packed with Syma X11C, the majority of you will think it’s some sort of a cheapo model. It looks and certainly feels cheap… but underneath the cheap outside lies a surprisingly good controller. Both sticks are accurate, buttons for features are intuitive and responsive. Generally speaking, Syma X11C’s controller falls heavily to the awesome side of the deal, and I’m sure your children will appreciate it. As for the actual specifications, Syma X11Chas quite a lengthy flight time for its price point. More precisely, it goes around 6 to 7 minutes. even 8 if you don’t push it too hard. Operating range is a bit shorter than you’d come to expect, roughly 30 meters. It’s still enough to cover the majority of your backyard so there are no worries in that department. Overall, it’s a nice little drone and I’m sure children of all ages will be really satisfied with its performance. Here we have another miniature quadcopter which has one simple concern – making sure everyone (and everything) around it is 100% safe. Plus, this little bugger looks great too, even with those bulky prop guards leading the charge. The controller is similar to that of Cheerson CX10, both design and size-wise. It’s good though so it should not cause any issues. With all that out of our way, let’s jump straight to action and further examine this sporty little flyer! Tiny whoops are extremely popular. However, their popularity is slowly diminishing because lots of new brushless micro models are coming out. Still, though, Eachine E010 cannot be considered as fully fledged tiny whoop since it does not have a camera. You can mount one on it and turn it into a proper FPV beast n a matter of seconds. But, even on its own, Eachine E010 is still a marvelous little drone. It flies extremely smoothly and can last for around 5 minutes per charge. Operating range isn’t half bad either, racking in roughly 30 meters. Features-wise, Eachine E010 sports interesting course reversal feature which basically works like return to home function on more expensive quads. There’s even 1-key flip button for 4-way acrobatics which are bound to amaze your little ones. By far, the best thing about Eachine E010 is the fact that it sports integrated propeller guards stretching out across all sorts of common indoor objects. Yup, the emphasis is on indoors meaning Eachine E010 is an indoor-only model. It’s small and runs on brushed motors so any kind of wind is bound to get it off course. Those prop guards aren’t helping with the wind either so make sure you keep this little bugger in-house only. HS170 by Holy Stone is also widely known as Predator. It’s basically his codename… but how did hardworking folk over at Holy Stone come up with such a name? Well, the drone itself looks aggressive and let’s be realistic – kids love cool-sounding names such as Predator. But don’t think of HS170 Predator as a cheap marketing trick because it’s really not! With a highly durable frame (that looks quite nice too), potent brushed motors and some interesting features. Headless mode and 1-key flips, to be more precise, and they are definitely well capable of entertaining children of all ages. Specifications of Holy Stone Hs170 are pretty good too. The flight time of this little bugger goes from 6 to 8 minutes which is really something once you see how much HS170 costs. Furthermore, operating range can extend from 30 to 50 meters and I’m sure you’ll agree with me that it’s a pretty high number for such a small drone. I’ve already mentioned above that Holy Stone is one of the best low-tier drone brands out there. With a plethora of available models and now slowly expanding to higher tier markets, it seems as though there’s nothing stopping Holy Stone for further upping their fanbase. And let’s be realistic here – HS170 is a great example of how they’re pulling it off. Extremely affordable drone with great packaging, surprisingly good build quality that’s really fun to fly. So, for all those reasons combined, Holy Stone HS170 is deservingly placed at the second spot of this list. Coming in at the top spot we have Helix Ion. We are talking about another miniature racer that’s specifically designed with just one thing in mind – safety! It’s not a new concept as far as children-friendly racers, but it’s safe to say Air Hogs did an amazing job with this one. Yup – Air Hogs is the company responsible for bringing Helix Ion to life. What’s so special about it, some of you may ask… Well, that and a lot more info surrounding Helix Ion can be found in the next 2 paragraphs! Children nowadays love drones. Wait, let me rephrase that – children nowadays love fast drones… and that’s exactly what Helix Ion is. This miniature (tiny whoop styled) drone is extraordinarily fast for a brushed micro drone. Even more so considering it sports an integrated propeller guard covering the entirety of its frame. This makes it virtually unflyable outdoors… but 100% safe indoors. As a matter of fact, Air Hogs Helix Ion is one of those indoor-only drones due to its safe design which makes it technically impossible to hurt someone… or something. Air Hogs is turning into the most influential drone brand on this side of the ocean. They are rapidly expanding their drone series of products and are actively focusing on models for children. Helix Ion, as previously mentioned, is one of them… and a good one for that matter. Considering the price tag of this little bugger, it actually provides exceptional value for money. You will end up paying approximately $50 for this little bugger, and for that price, you’re getting a full-sized controller and an insanely sturdy drone. Combine that with approximately 5-6 minutes of flight time and cca 20-30 meters of operating range and you’ll understand what a bargain you are looking at! This is one of the best drones for kids, no doubt. Children aged 9 and above are likely to want something a bit bigger than these miniature dronies. If that’s really the case, then I’m afraid you will have to do your research on the following 5 drones. Starting off at number 5 once again, we have Syma X5C-1. This is the upgraded version of one of Syma’s most popular entry-level drones. It has everything you would come to expect from a proper children-friendly drone – a camera, prop guards and generally solid flight performance… So, what exactly are we waiting for here?! Let’s strip this baby down and see what kind of performance you and your little ones can expect from it! Yes, if you could not see from the image above, Syma X5C-1 is a drone for kids equipped with an HD camera. You read that correctly – this little thing sports a fully fledged HD camera that works like a charm and doesn’t take too much of a toll on the total flight time (roughly 5 to 7 minutes). Your kids can use it to take cute aerial selfies or use their Syma X5C-1 to practice recording smooth aerial videos. Operating range is the final thing we’ll discuss here. Syma X5C-1 isn’t exactly the longest reaching drone on this list. With up to 30 meters it will be able to fly around your backyard… but anything further than that and you are bound to experience occasional signal drop. One of the best drones for kids. One thing goes without question – Altair AA108 is a rather pretty looking drone. With glossy black body coupled together with stylish blue finishing touches, it’s a real charmer, no doubt about it. The transmitter that comes bundled together with the package looks dashing too… With a nicely rounded shape and diversity antennas enabling quite a huge range. If you children demand a drone carrying a camera, rest assured Altair AA108 will satisfy their cravings. Not only does this little fella sport an HD camera, but it also works with WiFI FPV directly through your smartphone. Features-wise, you’re looking at a drone sporting 3 flight speeds, headless mode, and out of range alarm. If you are looking for a drone slightly more expensive than $100 but you want the best possible specifications for such a low price, Altair AA108 seems like a valid choice. It doesn’t just come with 2 batteries inside the package but also each of them can endure approximately 10 minutes of flight time. if you are among the lucky folk to have a huge backyard or live in a rural area with large, open fields, then you will be very happy to know Altair AA108 can reach cca 100 meters away from its stylish transmitter. Combine those marvelous specifications with a solid camera and splendid array of features… soon you will realize just what a good deal Altair AA108 really is. For what it’s worth – I consider it to be one of the best budget-friendly drones out there, not just because of the extra battery but general performance and appearance. After taking a peek at HS170 Predator by Holy Stone, now it’s time to up the tally and further investigate one of their slightly higher priced models. More precisely, their F181C drone which has been racking quite impressive numbers ever since its initial release. But what’s so special about this little fella and what exactly is the key to its massive success? Well, at the top of my hat I can assure you this little drone offers exceptional all-around performance and provides great bang for your bucks. Still not impressed? Well, continue reading then and I’m sure by the time you are done, you will realize the full potential of Holy Stone F181C. If this little drone for kids does not amaze either you or your little ones, then I warmly recommend you get one of those big-boy premium drones. It will be pretty clear at that point that you (and your little ones) are a power user and as such, you shouldn’t settle for anything other than state of the art. If, on the other hand, your little ones want a drone underneath $100 that can perform very well no matter what you put it up against, then Holy Stone F181C is the right model for you. It sports a plethora of features at your disposal, including headless mode, altitude hold and even one key return to home. However, you should know that these features are not based on GPS so you can’t expect pinpoint accuracy all the time. As far as the package goes, you are really getting a lot for your money. Not only will you get the drone itself along with the camera module, but you will also get an extra set of propellers as well as an extra battery coupled together with an extra charger. Add to that tally high-quality propeller guards and a microSD card to round it all off. In terms of specifications, Holy STone F181C users have reported massive oscillations in their performance. With that in mind, you are free to expect anywhere from 50 to 100 meters of operating range and approximately 8 minutes of flight time. Now we’re going to take a closer look at DJI Spark, a premium grade drone that can easily fit into the palm of your hand. Why is it good for kids? Well, if your little ones are crazy for selfies and social media, then Spark is the perfect present for them. Its general performance greatly exceeds all above-listed drones so it’s a real must-have for all drone enthusiasts who don’t take their kids’ wishes for granted … But DJI Spark costs significantly more than all of the above-listed, drones as well, making it sure it’s premium characteristics are known at the very first glance! Right after reading the word DJI, we can all already assume Spark is no joke! Nope – it’s actually a highly sophisticated (and advanced) selfie drone carrying a fully fledged mechanical gimbal (although it’s not a 3-axis one, but is still good nevertheless) on which you can see a miniature camera. The drone itself is really small so it’s actually surprising to realize it sports an FHD camera. There are also plenty of features to write home about – gestures, palm launch and control, several different flight modes and all the basics such as altitude hold and GPS. As a matter of fact, the only real downside to DJI Spark is that it’s not a foldable selfie drone. You see, it’s so small that it was virtually impossible to make it foldable without sacrificing performance or drastically upping the price. So, with that being said, DJI Spark still offers great performance at a miniature form factor. If you are looking for breathtaking specifications from DJI Spark, I am afraid you will have to steer away from the standard package. That’s because it will, to put it simply, not do a particularly good job as far as operating range is concerned. On the bright side, this issue is all gone thanks to DJI Spark Fly More Combo which adds in extra batteries and Spark’s dedicated transmitter. Thanks to the latter, this little bugger can reach 2 kilometers which is an astonishing feat coming from such a small drone. Operating range pushes the boundaries of what’s believable too, with approximately 15 minutes of active flying while recording smooth aerial videos in 1080p. The best drone for children older than 9 is definitely MJX Bugs 2W. 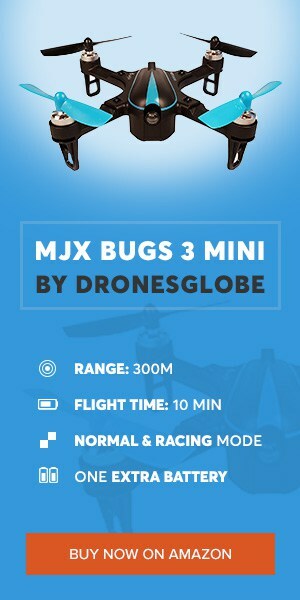 This is a marvelous addition to an already splendid list of drones made by MJX. In fact, it is basically their first ever smart drone in every sense of the word smart. Want to know why? Well, let’s start with this one simple fact – MJX Bugs 2W is not your average affordable drone! How come? Well, MJX Bugs 2W is a GPS drone. As a matter of fact, it has GPS and GLONASS, ensuring optimal satellite connectivity no matter where you are located. But GPS and GLONASS alone are not enough to make this drone that special. Luckily, they bring forth a ton of extremely useful features including altitude hold and return to home. Thanks to these features, MJX Bugs 2W is extremely stable (very important for photos and videos taken with its built-in 1080p camera) and reliable thanks to highly accurate RTH. In fact, there’s headless mode too… and if we are to be more precise as far as return to home feature is concerned, MJX Bugs 2W has a total of 3 different types. Low voltage auto return to home, lost connection auto return to home, and manual return to home. We have already had several tiny racers listed somewhere about… But it’s safe to say Leader 120 is the first in the line of fully fledged FPV racers that will blow your mind with its thrilling performance. One thing you should know about it at the very start – it does not come with a transmitter so you will have to provide your own. In fact, there are versions that don’t come with a receiver either, allowing you to install your own and pair it up nicely with your transmitter choice. While the latter can be problematic for beginners, BNF versions (come with receivers but not with transmitters) are easier to handle for newcomers to the hobby. Best affordable mini FPV racer!!! Despite the lack of a transmitter inside the package, Leader 120 is still an unparalleled mini FPV racer which shows you what you’ve paid for as soon as you first boot it up. However, for the full thrill of flying this little beauty in FPV, you will need to provide your own FPV monitor/goggles as well… and those can be quite costly if you aim high. But, if you already have both a transmitter and a solid pair of FPV goggles (along with a bunch of batteries), Leader 120 is going to be a very cheap investment for you. And it’s going to be a great one since Leader 120 got a solid upgrade that has just recently started shipping out via the FullSpeedRC official website. It upgraded 28A 4 in 1 ESC capable of running 3S batteries, as well as an Omnibus flight controller with OSD and buzzer. Plus – this thing flies absolutely great! Perhaps it does not come with a state of the art CCD camera such as the Runcam Micro Swift 2, but it comes with one of the best micro CMOS FPV cameras out there. Plus, if you give some effort, you can install Runcam Micro Swift 2 which will yield slightly better results as far as image quality and low light performance are concerned. Considering this is a fully fledged FPV racing drone, it’s not surprising to see short flight times spanning up to 5 minutes. Of course, operating range greatly depends on your receiver/transmitter combination so there’s no point in trying to estimate it. If image quality is paramount for your purchasing decision, then you will be more than happy to find out GoPro Karma works with all the latest and greatest GoPro action cameras. I know – as if there was any question about this. With that in mind, GoPro Karma natively supports Hero 4, 5, and 6. You might need a special harness for mounting them but the process is simple and easy so you will not have any difficulties. As for the stabilization, GoPro Karma sports Karma grip which works when mounted on the drone… but can also be used as body-mounted or handheld stabilization system. If you are an outdoors person or a thrill seeker, this is going to be a major deciding factor because Karma doesn’t limit you to just aerial photography. With Karma you are getting aerial and body-mounted/handheld stabilization, ensuring you get the best possible image quality whenever you might need it. Since GoPro Karma is primarily meant for people who travel a lot and enjoy outdoor recreational activities, it’s not surprising at all to see GoPro packing a sweet hard shell case with their drone. It looks sweet, nicely protects the drone and all of its accessories and is a breeze to carry with you at all times. As for the performance, GoPro Karma is pretty big but that doesn’t affect its flight time or maneuverability at all. With that being said, this drone can endure around 20 minutes of active flying and go as far as 3 kilometers away from its transmitter. Add to that a very compact design and plenty of great camera choices – there’s no doubt GoPro Karma is going to be a well-selling drone for years to come! Parrot is another high tier drone manufacturer with several bestselling drones to their name. With a couple of kid friendly drones in their arsenal, they’ve asserted themselves as the go-to option for safe and reliable sUAVs. Today, we are not going to be focusing on their miniature brushed models catered specifically towards young children. Instead, we will be going through their premium model – Parrot Bebop 2. It offers exceptional performance and adds a touch of sophisticated features that are bound to impress teenagers and young adults, giving them lots of freedom to fly their drone (and take photos/videos) just the way they want! The first thing that needs to be said about Parrot Bebop 2 is that it’s a damn pretty drone! It features a nice black and white color shceme which acts like an icing on the cake of an already gorgeous contrast-filled design. Build quality is on point too… but considering Parrot’s standards, that was never in question at all. In terms of basic features and functionalities, Parrot Bebop 2 comes equipped with altitude hold, GPS and a built-in camera with EIS that records videos in 1080p. The results are actually surprisingly good so if your kids are looking for a potent camera drone, Parrot Bebop 2 is a valid choice! Similarly to DJI Spark and DJI Mavic Air (right beneath this one), if you want to get the most out of Parrot Bebop 2 you will have to invest some extra money in buying accessories. More precisely, for the best possible performance out of this little bugger, I warmly recommend you opt for Parrot Bebop 2 Adventurer package. With this package, you will not only get SkyController 2 (which will boost the range to approximately 2 kilometers) but CockpitGlasses and a specialized backpack as well. So, combine these extra accessories with above-mentioned featured and roughly 20 minutes of flight time… and I’m sure you’ll come to your senses and understand why Parrot Bebop 2 is among the best drones for kids out there. Quickshots and FlightAutonomy 2.0 are just 2 main features of DJI Mavic Air, making it known that it’s not just another selfie drone for casual users. Nope – with unparalleled stability and a plethora of available features helping you get that marvelous shot, there’s no doubt DJI Mavic Air is a powerful tool for professionals too. As I’ve already stated above – DJI Mavic Air is the newest drone model made by DJI. When the whole wide world expected DJI Mavic Pro 2 or the new Phantom series… DJI released this little bugger… Their smallest drone ever, second only to DJI Spark, their very own selfie drone. However, DJI Mavic Air can also be considered as a selfie drone. A selfie drone with some more advanced features and much better camera than any other selfie drone available on the market. It’s true – not only does this gorgeous little fella has a 4K ready camera but a mechanical gimbal as well. Those 2 combined allow it to capture brilliant aerial photos and videos, in some cases even better than that of its big brother – DJI Mavic Pro. We should not forget about its performance either. As is the case with DJI Spark, if you want the most out of Mavic Air you will have to get the Fly More Combo which will provide you with its dedicated controller. This way you will have access to roughly 4 to 5 kilometers of range. Last but not least, the flight time of DJI Mavic Air goes to approximately 18 to 21 minutes which is really praiseworthy if you ask me. Coming in at the top spot is DJI Phantom 4 Pro Plus version, the best mainstream drone available on the market at the time of writing this article. In terms of general design, performance and packaging, there’s no denying this drone is creme de la creme of the entire market. With brilliant (yet highly simplistic) design and top-flight performance, there are just a handful of drones that can be put in the same category with DJI Phantom 4 Pro Plus, and honestly speaking – some of them are also made by DJI. But what’s the trick with DJI drones? How are they effectively crushing the boundaries with each new generation? Let’s find out, shall we!? The best aspect of DJI Phantom 4 Pro Plus is its impressive (to say the least) 20MPX camera with a gigantic 1 inch CMOS sensor capable of recording 4K videos at insanely smooth 60fps. Furthermore, it’s mounted on a 3-axis gimbal for extra stabilization, ensuring optimal image quality for professional and casual users alike. In terms of the Plus version, you should know that the only upside it has over the standard is that sweet 7-inch Android-powered device on that all-white stylish transmitter. It’s really bright and responsive, enabling you to enjoy HD video downlink no matter the weather outside. I should also say a thing or two about this little bugger’s features. Of course, you can expect everything you’d come to expect from a premium drone… and then some! DJI Phantom 4 Pro Plus sports 5-way obstacle avoidance, ActiveTrack, TapFly and a whole bunch of additional smart flight functions as well as extra reliability in the form of failsafe and auto return to home. All in all, if all you’re looking for in your next drone is a complete set of features, there is no doubt you should be closely inspecting DJI Phantom 4 Pro Plus! If you ever wondered what drone brand has the highest specifications on the market, the answer is quite simple and straightforward – DJI! They have been pushing the boundaries of high-end drone performance for several years already. The newest addition to their Phantom lineup (Phantom 4 Pro Plus) pushes the boundaries even further with 7 kilometers of range for both the controller and live HD video feed. Battery duration has stayed the same, around 27 minutes. Such high numbers are obviously a result of years and years of active research and hard work coming from DJI staff… and that’s basically why they deserve lots of praises! Not just for pushing other brands to innovate in order to stay competitive but for actively coming up with new (and highly effective) drone tech. 1. Is it a toy grade drone ? First, and most obvious, make sure you buy a toy drone for your kid. Although drones like DJI Phantom and Parrot Bebop have autonomous functions which make them easy and safe to fly. These are much more powerful drones, larger and heavier, they are not a good fit for children. Choose a simple toy grade drone, with a low margin of error, one which uses protective frames and is ideal to learn and practice. 2. Is the drone suitable for indoor or outdoor flying ? Contrary to what many people may think, drones for kids are not always fit to fly both indoor and outdoor, some drones only support one environment. A good indoor drone needs to have a stable hovering, a responsive control and it doesn’t particularly need to endure the wind. Most drones can fly both indoor and outdoor. However, if you prefer your kid to fly indoors, pick a drone that has a stable hover and preferably with a protective frame around its motors and propellers. Depending on the area you are flying the drone it could either be a small or large drone. Be aware that a larger and heavier drone will cause more damage on the inside. Drones with a high yaw (faster rotating motors and consequently propellers) will be more difficult to control, especially indoors. If you are looking for an outdoor drone, make sure it has enough power to fight the wind, many small drones are not able to do this. During this article, we will let you know which drones are suitable for indoor, outdoor, or both. 3. Does it have a stable hovering ? This is very important – if stability is hard to maintain the drone will be harder to control. If the drone has an unstable hovering, it will require more command input by the pilot to maintain the drone steady in the air. A good drone for learning and practicing will have a stable hovering, even when facing some wind, thus requiring less command input for the drone to be steady. Therefore, drones have a Gyro system, to ensure the drone has a good balance and won’t fly away or become uncontrollable. However, some drones have a more efficient Gyro, making them ideal to learn and practice. On this article, we only mention drones with an above average Gyro built, for our kids to fly the most efficient drones available in the toy drone market. Keep in mind that weather conditions will affect the stability of the drone, if flying outdoors make sure your drone is suited to fly on the current weather conditions (avoid strong wind). 4. Is it resistant and lightweight ? Your kid you will crash the drone. We all do, that’s why we learn and practice. Your kid will be no exception, he will eventually (most likely right away) crash the drone. This is not a problem, and crashing the drone is part of the fun! As parents, we want to value your money, and that means the drone must last. You and your kid will want to fly as many times as you want without the drone getting damaged or worse. It is important for the drone’s frame to be durable. Most toy drones are made of ABS Plastic, a cheap and lightweight kind of material, as the one used on LEGOS. It’s a material that won’t damage anything when crashing or colliding with something or someone. The material will resist most crashes and collisions. However, and as always, take care of your drone, fly it wisely, don’t dive it into the water, don’t fly it on the rain, don’t fly it near car traffic. 5. Are your new drones for kids controlled via a 2.4Ghz remote controller or WiFi smartphone? On this list, we have drones that are controlled via a standard 2.4Ghz remote controller or through a smartphone. Usually, a 2.4Ghz (or 5.8Ghz) controller is preferable, but if your kid already owns a smartphone or you don’t mind borrowing him yours, you can choose to buy a drone that connects to the smartphone via WiFi through a free to download app (available for both Android and iOS in most cases). The drone provides its own WiFi to which the smartphone connects to. I believe that for learning and practicing purposes a 2.4Ghz remote controller is always better, however, if your kid is used to handle a smartphone, these types of toy grade drones work just as fine. Often the drones that make use of the pilot’s smartphone to function as a controller, are cheaper as the manufacturer doesn’t have to provide a controller. 6. What features does your drone for kids have? Features are important. Why? Because some make the drone easier to control, while others enhance the fun you can have with it. One of those features that will make the drone easier to pilot is “Headless Mode”. We will discuss this feature on the “Brief Explanation of the Features” section of this article. When you see a drone with “Headless Mode” feature, if it functions correctly you will know you found a drone with an “easier option” to be controlled. Indoor or outdoor, doesn’t matter. If your kid is younger than 14 years old, make sure you are nearby when he’s flying a drone. Although the toy drones on our list are harmless and easy to control, it is always important to have safety as a priority. Needless to say – adult supervision is of crucial importance for both the safety of your children as well as everyone around them. That’s basically the main reason we are mentioning it right off the bat in this section of our article. If you are indoor make sure there’s enough space for the drone to move around. If it’s a smaller drone with a stable hovering, you won’t have any problem flying the drone in a living room or even in the bedroom. Prevent the drone from flying close to areas where you can’t reach afterward in case you lose control and crash. In case you are flying a large and heavier drone, accordingly extend the free area, therefore avoiding collisions against people or objects. Before actually flying their drone for the very first time, first, you will need to bind the drone to its dedicated remote controller, also known as the transmitter in the drone world. Afterward, simply turn the transmitter on, place the drone on a level surface, push the throttle down and then upwards and then down again. The drone is now bound to the remote and you can start flying (some drones may not require this and some may even come with different binding methods). A self-explanatory feature, drone’s camera transmits live video to an LCD monitor or smartphone screen. There are drones which transmit video through 5.8Ghz frequency directly to an LCD monitor generally included in the package. Other drones transmit the live video through an app directly to the user’s smartphone. The pilot can watch in real-time (may have latency in some cases) whatever the drone’s camera is capturing. To better understand this feature, first, we must discuss how a drone orientation works. Like any vehicle, every drone has a front and a rear, however, sometimes it’s hard to tell which is which due to the often-symmetrical design of drones. To solve this issue, many drone makers design their drones with different color propellers, so the pilot is aware of the front. However, when flying the drone to a longer distance, the pilot can’t tell which is the front and which is the rear. This causes an orientation problem. With Headless Mode enabled, the drone’s front and rear are irrelevant. The drone will respond to commands despite where is pointing at (left is left and right is right). If Headless Mode is enabled and your drone’s front is pointing to your face if you push forward the drone will fly in your direction instead of going forward. When enabling Headless Mode, there is something you must do before taking off, the drone must be positioned in a way that its front is your front. Headless Mode must always be activated before flight, and never during flight. Basically, the drone does a 360º spin in any direction. Smaller and faster drones will do this very quickly without losing practically no altitude, it’s a neat trick. Larger and heavier drones can also do a 360º aerial stunt but they aren’t as quick and they lose a slight altitude because they take longer to spin. To do this you just must press a button on the remote controller or smartphone app. It’s a hassle-free acrobatic fun.